Albert Bledsoe (1809-1877) was a 19th century scholar whose work on the philosophical and legal issues concerning the Secession of the Southern States altered the course of National government policy. Bledsoe was a man of tremendous capability who had a remarkably rich career. After being by turns professor of mathematics, lawyer, and church minister, the Civil War forced Bledsoe to re-enter military service as a colonel in the Confederate Army, but then he was promoted to chief of the War Bureau and assistant Secretary of War. Jefferson Davis sent him to London to sway English public opinion in favor of the Confederacy, and to collect historical data that could be used to defend and justify the newly formed Confederate nation. Bledsoe's peregrinations brought him into contact with many persons who were to become important figures in American history. For example, when he practiced law in Springfield, he was in the same courts as Lincoln and Douglas. He must have obtained certain "inside knowledge" of the thinking of these men, which gave direction to and validation of his own research. However, Bledsoe's approach to the issue of Secession is entirely original. His masterpiece, Is Secession Treason?, affected the course of American politics not through partisan attack, but through the use of logic. Bledsoe, unlike many other political commentators, abstained from polemics in his writing, preferring to empirically analyze the legal issues through systematic discourse. 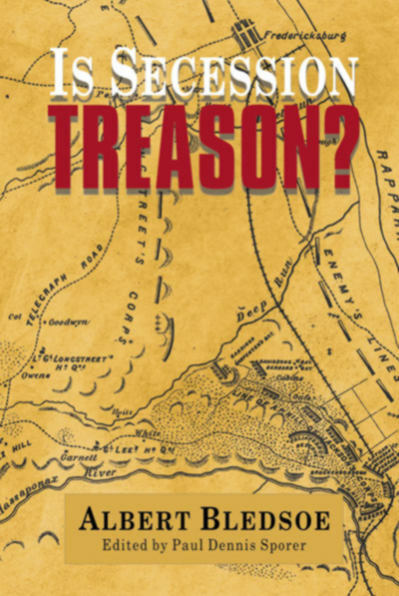 More information on Is Secession Treason?